[DEC. 21, 2002] The Lincoln Public Library District has received two new grants from the office of Secretary of State and State Librarian Jesse White. The Dream Again grant entitled "Great Books, Great Films" will be used to purchase classic movies in the DVD format and great works of literature in the CD format. The library will also receive a new DVD player and public performance movie licensing rights for one year. The license will allow the library to host a series of public programs with the new DVD movie titles. Lincoln will share this $32,100 grant with the public libraries in Chatham, Rochester, Clinton, Effingham, Mount Zion and Taylorville. The grant is part of $2.46 million awarded to Illinois libraries by Secretary White's office. The Opportunity Knocks grant entitled "Terry Turtle's Teaching Totes" will be used to purchase tote bags for the youth services department at the library. The tote bags will cover a variety of topics and contain books, puppets, stuffed animals, activity cards and teaching suggestions. These tote bags will be ideal for young children or developmentally disabled patrons and will be available for checkout. This second grant is part of almost $200,000 in grants awarded to Illinois libraries by Secretary White's office. For more information please contact Richard Sumrall at 732-8878 or visit the library, 725 Pekin St. 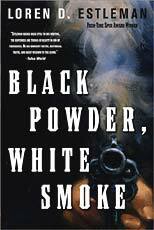 In "Black Powder, White Smoke," Loren Estleman introduces us to four characters living in 1885. Honey Boutrille is an ex-slave living in New Orleans. He is also the owner and operator of a bordello, "The House of Rest." Honey's story begins with a disturbance within his establishment in which a white man has mutilated one of his "girls." Honey patiently waits while his girl is held hostage, and when the perpetrator tries to make an escape, Honey shoots him in the head and begins life as a wanted man. Emerson Emerson, or Twice as he is more commonly known, is a train robber and an admitted murderer. After a job goes bad, he holes up in a familiar town, unwittingly offends an old "Chinaman" and finds out too late that the "Chinaman's connections have put a price on his head." Twice murders the Chinaman to collect the reward and flees west, leaving a trail of robberies and murders to mark his path. Ernest Torbett and Casper Box are two men who would exploit Honey and Twice. Ernest has been given to opportunity to give up his lucrative position as an ad writer for the meatpackers of Chicago. He follows the trail of the infamous Honey Boutrille and writes a serial about the "Black Devil" to instill fear in the hearts of white readers everywhere. Casper is a theatrical agent who, after reading of Twice's misdeeds, decides that Twice is the perfect attraction for a new Wild West Show whose popularity will exceed that of The Buffalo Bill Show. Estleman takes us to Denver, Colo., where all four characters converge for a climactic finish and an epic battle of good versus evil. [JAN. 8, 2003] DECATUR -- Theatre 7 - Decatur's Community Theatre will present the comedy "Epic Proportions" in February at the Decatur Civic Center Theatre. Tickets for the production go on sale to the general public beginning Monday, Jan. 13, at the Decatur Civic Center Box Office. "Epic Proportions" is set in the 1930s, when brothers Benny and Phil find themselves in the Arizona desert as extras in a huge historical epic film. Before they know it, Phil is directing the movie and Benny is starring in it. To complicate matters, they both fall in love with Louise, the assistant director of extras. The Theatre 7 production is directed by Jayson Albright. Cast members are Jayson Albright, Shawn Becker, Doug Bishop, Peter Churukian, Amy Hoak, Tim Haworth, Alison Logan and Matt Tucker. Performance dates and times are Feb. 7, 8, 14 and 15 at 7:30 p.m. and Feb. 9 and 16 at 2 p.m. For ticket information, call the box office, (217) 422-6161. For more information, visit www.decaturnet.org/theatre7. [JAN. 8, 2003] DECATUR -- Theatre 7 - Decatur's Community Theatre will have auditions soon for the second production of its 39th season, the epic musical "Ragtime." Two children: one boy and one girl. Must be small of stature. Both children sing solos and have speaking lines. The auditions will be at the Decatur Civic Center Theater on Sunday, Jan. 19, and Monday, Jan. 20. Children 7-10 years old audition at 5 p.m. and adults at 6:30 p.m.
To try out, prepare a song two minutes in length. An accompanist will be provided. A short piece of dialogue will be provided, as well as a short dance step. For more information about the auditions, visit http://www.decaturnet.org/theatre7/audition.htm. With questions, call Mike Redlinger, director. The daytime phone number is (217) 428-4315. [DEC. 9, 2002] Lincoln Community Theatre is pleased to announce three productions selected for the summer of 2003. Kicking off the 32nd season of live theater for the Lincoln community will be the hilarious musical "Nuncrackers." This fun-filled show is a continuation of the antics of the dauntless, darling nuns of Mount St. Helen's Convent who delighted Lincoln audiences in the "Nunsense" series several summers ago. Audience participation, one-liners, a rum-soaked fruitcake, dueling sugar plum fairies and dear Sister Amnesia will definitely start the summer theatrical season with humor and fun. The July production, "Steel Magnolias," is one of our best ensemble productions. The familiar, bittersweet story touches all the emotional peaks and valleys of life in a small Southern community. From wise-cracking Truvy to unsure Annelle, the characters in this poignant play promise to touch everyone with both laughter and tears. Ending the season on a patriotic note, LCT's final production of the summer will be "1776," a stirring, yet humorous musical featuring a large cast representing our founding fathers. Humor abounds with fast-paced dialogue involving Ben Franklin, Henry Lee and other early congressional characters, along with catchy, patriotic music. To kick off the holiday season, Lincoln Community Theatre is offering holiday gift certificates for season memberships for the summer 2003 season. Certificates can be mailed directly to the receiver or to the gift giver. Certificates for adult memberships are $20 each, and those for children through eighth grade are $12 each. Requests for gift certificates may be sent to LCT, Box 374, Lincoln, IL 62656. Further information is available at (217) 732-7542 or by visiting the LCT website, www.geocities.com/lincolncommunitytheatre.